Welcome to your onpage SEO tutorial, Part Two of a series of SEO lite and easy for bloggers! I’ve created this mini course to help bloggers get over feeling intimidated by SEO. It’s part art, part science, but can be mastered easily following a few practical steps every time we write a blog post. In Part One, we saw how to write killer SEO blog post titles by doing our homework on what keywords and phrases our target audience is searching for. Getting the title honed with those keywords will see you get off to good start in writing a perfect post. The rest of the page content will flow naturally once you know who you are writing for and why. This post moves on to tackle what is known as onpage SEO – the hows and whys of getting to grips with crafting SEO within the body of your post. Onpage SEO is not only about placing more of those keywords. And as we’ll see, they need placing with caution! Here, I cover the elements of onpage SEO and best practice in carrying it out. These are the essentials, and really don’t take much time to factor in to your post writing. Again, it’s more a case of getting into the habit of doing SEO rather than worrying about it. This is the first tip, and for good reason. Google spells in its SEO guidelines that natural content written for people not SEO bots is what truly matters, in their eyes. 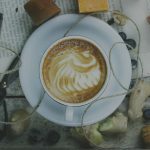 Regular blog posts with fresh, engaging content are all well and good, but how do we define this? The bullets here map out an action plan on writing natural SEO’d posts. Credible – content that shows you’ve done your homework before spouting off is vital to showing your credentials on your chosen topic. Don’t push out lightweight, spammy content in a rush, for the sake of getting a post out. And certainly don’t ‘scrape’ others’ content. Even topping and tailing other people’s content is plagiarism and could end up with bots finding duplicate content and downgrading your site. High quality content – This is all about giving your visitors a quality experience with content that educates, informs, entertains or does a combo of these. Don’t warble on in a post just gratifying your own thoughts or interests. Ensure your content is of direct relevance to your visitors’ needs. Does it answer a pain point for them? Does it give them food for thought of their own, if it’s more of an opinion piece? Raise questions that can give rise to visitor engagement. If you write longer posts (2000-5000 words), you can put out variations of your post’s message on social media throughout a week. This is one way to foster engagement and drive traffic to your blog. Engaging – Remember those old school essay plans that needed a structure? Do keep on point to engage your reader by walking them through your logic. Whatever your post topic, make sure you’ve a clear road map with a beginning, middle and end. Don’t put people off with sloppy grammar or typos. And remember that your audience may come from various cultural backgrounds and not understand in-house jargon. Spell anything out that may be unclear. Style – be yourself, but not too insider or singular that you exclude people in your target audience. You need to have a style that is memorable but readable, approachable and accessible. If you need some help on finding your blogger voice, then see my post here. Visual impact – blogs posts needs good visuals, not only for SEO (see the Alt-tag point below) but also to give you shareable content on social media. One way to make them shareable is to add a text overlay on the image. If someone comes across them on social media, your post will be instantly understandable. 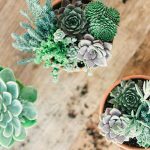 Add social share buttons to your post. The more opportunities for your content to be shared, the more traffic you can drive and backlinks you can create. (Backlinks are part of my next post on ‘offsite SEO’.) Also, don’t have too many distracting ads or affialiate links down the sidebar or within the post. They can be off putting for readers. Avoid Spammy content that links back to dodgy sites – do check any sponsored post offers you get. They may damage your Search Engine Results Page (SERPS) rankings and may outstrip any monetary gain from them. Quality now dealt with, we’re back to the more techie and administrative aspects of SEO and to our old friend the keywords. Remember those keywords you defined for the post title? Well, now you’ll need to weave them naturally into your body content. If you have the Yoast SEO plugin installed, you’ll have a nifty traffic light indicator system to show you how well your post’s SEO is doing, and it will tell you the density of your keywords. Too few and it shows up red. Just right, it will show a green. In the example below, you’ll see the indicators Yoast uses to tell you if you’re post is SEO’d well. 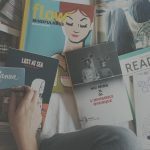 The trick is to work one instance of your keyword within the first paragraph; if possible in the first sentence although you don’t want to sound spammy nor repeat the blog post title. Then, add it around two more times, with, if you can, one iteration being within an H2 subheading. H2 is the html defining a large subhead. In less than a nano second, Google bots will scan your page for keywords, and if they find them in the first paragraph and a subhead, they will work out that your page is indeed about that keyword. The way they work using secret algorithms is beyond us here, but suffice to say that your keywords needs weaving in, but with a light hand. Don’t write weird sentences just to get them in. Go back and ask yourself if you’d have written that keyword sentence naturally if you weren’t thinking of SEO! That’s the ultimate way to test your content. And a good way to avoid keyword stuffing your post. Too many instances of keywords set the bots’ alarm bells ringing that you’re a spammy site with content written for bots only! That’s part of Black Hat SEO, which is totally against Google’s guidelines. We’re not done with keywords yet. You need to add them to any media uploads you add to your post. Ideally, when you first save your media (video, image file or audio), save it with the keyword in the file name. So, don’t just take some gobbledy-gook from your camera card like 094392.jpg. Save as a different file name with those keywords in it. If you have several images in one post, don’t use exactly the same keyword(s) on each image with a numbering system. That is, don’t put maltajazzfestival1.jpg and maltajazzfestival2.jpg. This will be seen as duplicate content. 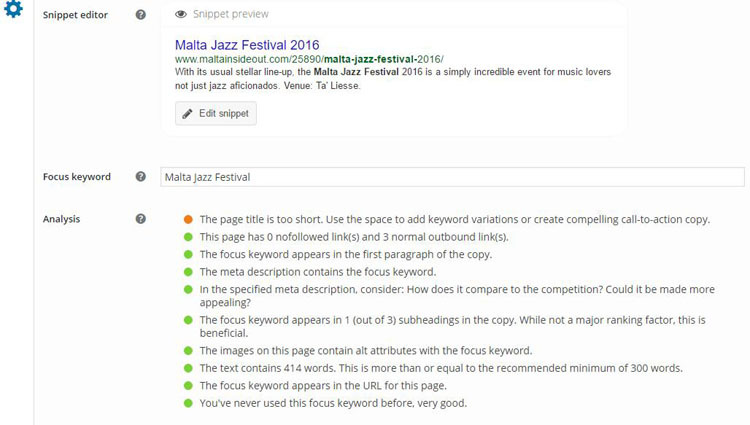 Try putting Maltasummerjazz.jpg, for example, or jazzfestivalmalta.jpg. Any variation on your keywords will be fine. It’s worth noting that Google likes and searches images so try to have at least one, if not between 2-3 images each post. Again, this gives you the material to post on your social media too. Pinterest loves longer images up to 1192px or so. Those Pins gets more shares than horizontal or square images, so bear that in mind too when devising post images. 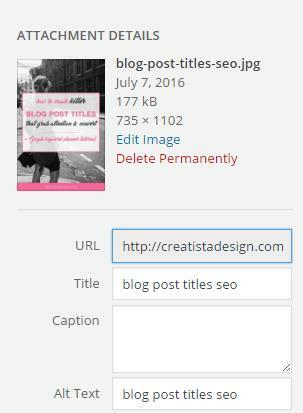 The last part of SEO-ing images is to ensure you write both title and alt-tag descriptions in the fields that appear when you hit ‘Add Media’ on the WordPress post dashboard. This is important for usability, to aid visually-impaired users and to ensure the image title will show even if images are disabled in the browser by the user. The alt-tags are clues to bots about your page content so please don’t leave them uut in your rush to get that post done. An image with a few words speaks 1,000 words when it comes to search. Look again at the Yoast image above and you’ll see the second green light talks about links. When bots crawl your site, they do so following links. If you have around three internal links to other pages of relevance on your site, the bots will stick around longer and head off to crawl or rather ‘map’ more pages. Don’t link at random to any old content. Do link to other pages or posts that back up a point or link to your current content. For instance in this post, I link to my first SEO post about killer blog post titles. Internal linking also helps your post readers to stick around longer and head off to read more. No harm in suggesting other relevant content they might like. The longer they are on your site, the lower your bounce rate – the metric in Google Analytics that measures the percentage of site visits that are one page only. A high bounce rate means your site is not sticky enough and not engaging visitors. 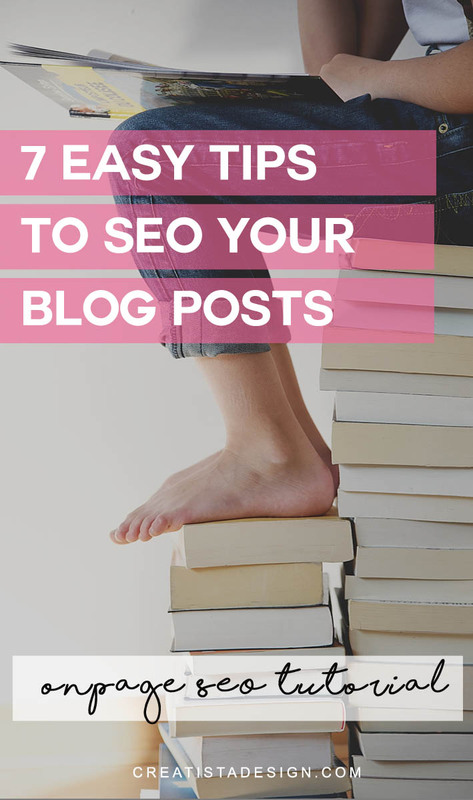 If you ensure your posts are linking coherently, then both visitors and search engine bots will see the connections and be sure about your blog topic. First, what is a meta description? It’s the snippet line or two that you’ll see in search engine results pages under the post or page title and the url. 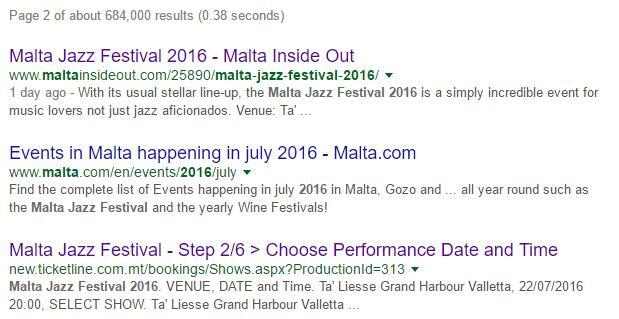 In the example below of a search for Malta Jazz Festival 2016, my post is top of page 2 (quite pleased as I posted it only a day ago!). You will see the handcrafted meta description with my chosen keywords in bold. Meta descriptions are another clue to those Google and Bing bots. They reside in the html section of your page. Now, this is mostly invisible to us so the best way to add these is to use the nifty Yoast plugin. In that Yoast screen shot above, you’ll notice the field ‘Edit Snippet’. Click that to open up a field and write your handcrafted meta description. Don’t add meta tags as they override the description and are less useful. If you don’t craft this yourself, neatly summarizing your post, then Google SERPS pulls up the first line of your page or post. This might not be a very useful summary of your post, so I recommend writing your own in that snippet editor. This may seem out of place in our discussion of onpage SEO, but hear me out. If you add visible subscribe forms, ideally for some content upgrade on your post, then your visitors are now on your email list. This way, they can be notified about new juicy content on your site. This drives more traffic to your blog posts through backlinks from your email. This gives your post more credibility as a valued source, and the bots will rank you higher. Don’t assume all your subscribers are visiting your blog each week. They need pointers about what’s the latest serving. Writing relevant, engaging enews is another topic though! I mentioned this earlier, but just a reminder to ensure your blog has share buttons to encourage visitors to share on their media. You need to share in various formats on all your social media too – for those backlinks. The more shares, the more backlinks and the more traffic, all being well. I know the above sounds like an awful lot to get through each post. But believe me, it’s quite quick, once you get into the routine. That Yoast SEO plugin makes a lot it easy work. Don’t take all the plugin’s points to heart. Yoast has introduced a readability aspect of the plugin, which you can turn off. I do! I can’t write each sentence less than 20 words, which is what it recommends. Remember, SEO is free marketing and direct, organic traffic is gold dust for you. Social media can be fickle and you don’t own it. Content on your own platform is where you should direct efforts to be found. I can’t stress enough how valuable natural search is to your visibility. Put this onpage SEO tutorial into action and monitor your Google Analytics for a couple of months. I am sure you’ll see those SEO’d posts come up tops in your page content rankings.